The Children’s Room sessions are mornings, afternoons or all day from Monday to Friday during term times or full time for 48 weeks a year. On arrival, the children are welcomed into the school by our teachers. The first task is to hang-up coats and change into non-outdoor shoes for use in the school. For the initial part of the session, the children are free to choose their activity which is normally something from either the practical life or sensorial aspects of the Montessori exercises. Managing their own clothes by using dressing frames to practice buttons, zips and bows. Using jugs to pour beans, which naturally leads onto pouring drinks and laying tables, encouraging social skills with friends and teachers. These all provide a feeling of independence and self worth. Sensorial exercises help the child to learn through his or her senses. 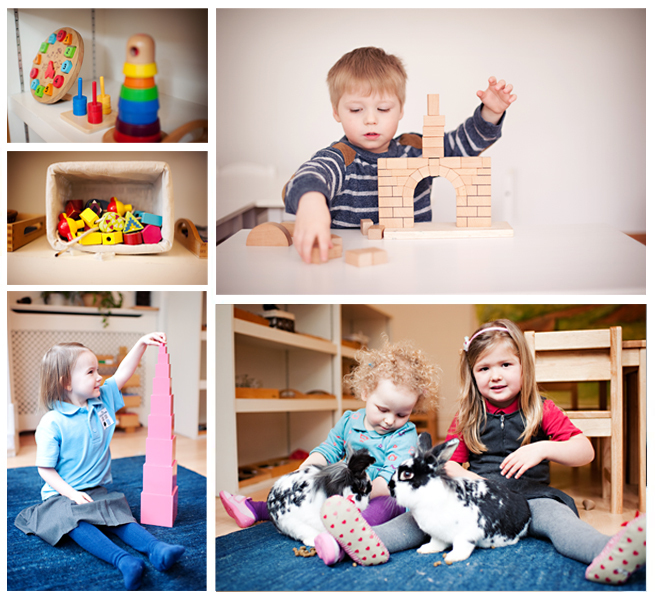 Montessori devised a whole range of materials to help the child sort, match, and grade. The materials are designed to help the child’s mind focus on a particular quality, e.g. wooden rods that teach ideas of length or cubes in a pink tower that teach size. 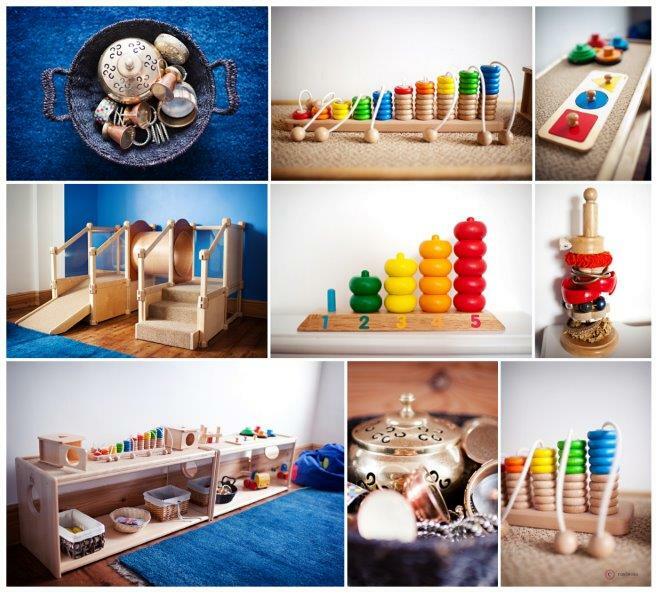 One of the nice aspects of the Montessori approach is that wherever possible natural materials are used instead of plastics and synthetics. Suitably refreshed, we may have a walk in the park opposite as we are currently introducing Forest school principals into the nursery. 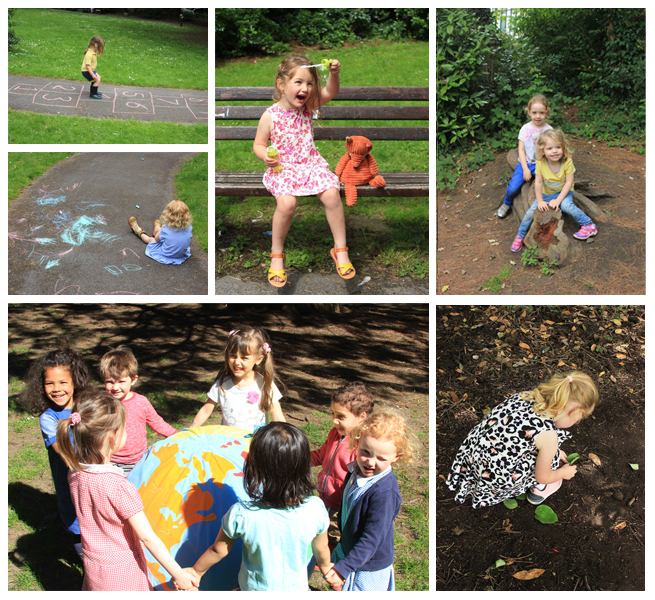 To round off a typical session the children may work in our small garden, use water play, work on themed art work and participate in other creativity sessions. Then, it is time for a story, some songs and all too soon it is time to go home. Children that are staying for lunch will eat together in a separate area. If they are going onto attend another school they will be taken there by a teacher. Children staying for the afternoon session can have a rest after lunch before commencing once again in their chosen activity. Again, afternoon children will be welcomed by a teacher and after changing from outdoor clothes will begin work in the first classroom until the children from the morning session have finished their lunch. Afternoons follow the same pattern as the activities described above and each child has the freedom to choose, within the structured environment which activity they wish to participate in. We always have a large variety of art and craft materials available at all times in case someone feels the need to express their creativity! We also have two very friendly rabbits Roxy and Reggie for the children to engage with. The Children’s Room has a very high teacher to child ratio (one to four) so we can always ensure that whichever activity chosen, it is being done in the most beneficial way for the child. In summary, we at The Children’s Room are striving to create a calm, ordered environment that allows us to respect the Montessori principles. Therefore, if a child is absorbed in an activity, then it is important that they are left to complete it at their own pace, so that they learn the pleasure of achieving something themselves to their own satisfaction without constantly being redirected or pushed from activity to activity. With thanks to all the staff at The Children’s Room…A Poem From Ollie Jones…..The Children’s Room in Uplands is where I go each day, I have great fun and stories and lots of time to play, I always feel so happy when I go in through the door, and fun’s not all that happens-there’s really so much more, because I’ve had the best of starts, in this lovely place, I will go on to my ‘big’ school with a happy smiling face! From Ollie and Family.